General Motors subsidiary OnStar is working toward an NFC solution that would enable payment at electric car charging stations. As reported by NFCWorld.com, the increasing number of electric cars has produced a unique opportunity for NFC-enabled payments. 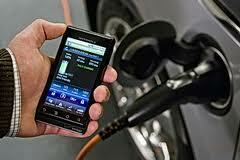 OnStar sees the need to charge away from home will only increase, as will the need to know the cost of charging. This is where OnStar’s Park-Tap-Charge smartphone app comes into play. The app is designed for use at charging stations where usage fees are applied as well as to inform drivers in advance how much a charging session will cost. By tapping their smart phone to a charging station, electric car drivers will be able to see payment options and initiate the flow of electricity. The current prototype iteration of the app features an NFC tag embedded in the charge station, which the driver taps with a smartphone to initiate payment from a chosen, connected account. Before carrying out the transaction, the Park-Tap-Charge app will show the hourly charging rate as well as the estimated time and cost to fully charge the vehicle. In addition to the Park-Tap-Charge app, OnStar has also launched a separate app that determines if a driver’s destination is beyond reach of a single battery charge. In such cases, the app plots a route that takes the driver past charging stations at appropriate intervals. See the full NFCWorld.com article here.